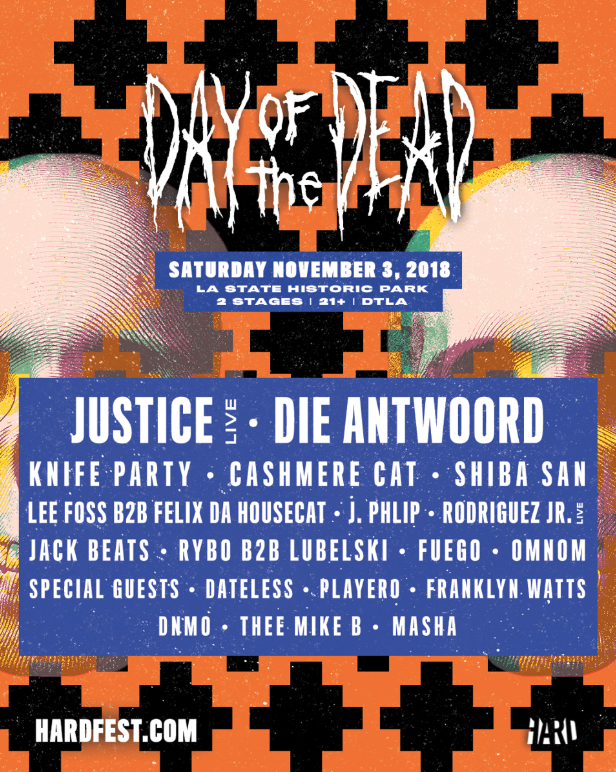 It's been six years of silence, but come Saturday, Nov. 3, HARD's Day of the Dead Festival crawls back from beyond the grave with a lineup that'll make you scream today (Sept. 27). Justice adds a surprise date to its live production tour, which was previously scheduled to end with two weekends at Austin City Limits (Oct. 5 to 15). South African dance-punk-rappers Die Antwoord, Australian bass behemoths Knife Party, and Norway's champion future basser Cashmere Cat round out the live stage. Stage two is headed by a special, double creature-feature of Lee Foss b2b Felix Da Housecat. Shiba San and J Phlip from the Dirtybird crew will also be there. Day of the Dead plants its flag in LA State Historic Park, the same venue where Zedd wowed a huge audience in July, another Insomniac production. Tickets for the 21 and up event go on sale Thursday, Sept. 27, at 12:00 p.m. PST.